Police escorting the suspect on Friday. KUCHING: Police have arrested a Facebook account holder suspected of circulating a video clip in social media depicting a woman being stabbed and beheaded by a masked man. 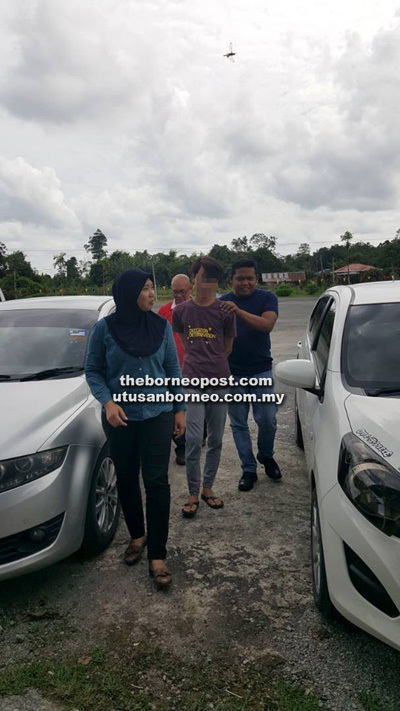 State CID chief Datuk Dev Kumar said the suspect, a farmer aged 21, was picked up in his house by a CID team from Simunjan district headquarters led by Insp Norliana Md Faizal at Rumah Jerugo, Kampung Sagu, Sebuyau at 1.05 on Friday. The suspect was later escorted to Sri Aman district headquarters for further investigation. “A mobile phone believed to be used by him to post the fake news was seized. A police report was lodged on the circulation of the video clip and the case is being investigated under Section 500 of the Penal Code and 233 of the Communication and Multimedia Act,” said Dev Kumar. He pointed out that some Facebook users had falsely attributed the video to the Sri Aman murder case where the head of a woman was found at the riverbank of Skait, Sri Aman. “Checks by the police confirmed that the video originated from a country in South America and is in no way related to the case in Sri Aman,” he stressed. Dev Kumar also warned social media users to stop spreading false news that could hamper the investigation and prosecution of the murder case.